The paper, authored by researchers from the Marine Megafauna Foundation, Murdoch University (Australia), University of Siena (Italy) and Hawaiʻi Institute of Marine Biology, stresses the significant risks microplastics pose to megafauna since these need to swallow hundreds to thousands of cubic meters of water daily in effort to capture plankton. They can ingest microplastics directly from polluted water or indirectly through contaminated prey. Lead author Elitza Germanov, researcher at the Marine Megafauna Foundation and PhD student at Murdoch University: "Despite the growing research on microplastics in the marine environment, there are only few studies that examine the effects on large filter feeders. We are still trying to understand the magnitude of the issue. It has become clear though that microplastic contamination has the potential to further reduce the population numbers of these species, many of which are long-lived and have few offspring throughout their lives." "It is vital to understand the effects of microplastic pollution on ocean giants since nearly half of the mobulid rays, two thirds of filter-feeding sharks and over one quarter of baleen whales are listed by the IUCN as globally threatened species and are prioritized for conservation", she adds. "Our studies on whale sharks in the Sea of Cortez and on fin whales in the Mediterranean Sea confirmed exposure to toxic chemicals, indicating that these filter feeders are taking up microplastics in their feeding grounds. Exposure to these plastic-associated toxins pose a major threat to the health of these animals since it can alter the hormones, which regulate the body's growth and development, metabolism, and reproductive functions, among other things", says Professor Fossi who co-authored this paper. 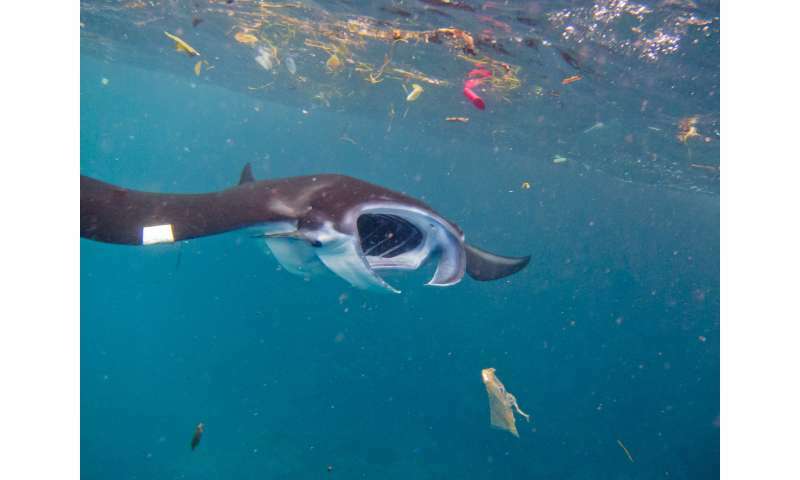 "As plastic production is projected to increase globally, future research should focus on coastal regions where microplastic pollution overlaps with the critical feeding and breeding grounds of these threatened animals. Many areas are biodiversity hotspots and of economic importance due to fisheries and marine tourism. Targeting these with the backing of local government and industry will help ensure efforts to mitigate the plastic threat are employed to their fullest", Germanov concludes.